ARNIE's studding tranmission upgrade was tested on Friday. 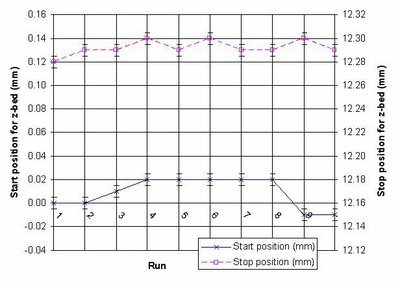 The stepper motor was directed to rotate 1000 steps and back again 10 times with a delay of 100 cycles per step. A calliper was used to measure the position of the z-bed at the start and end of each run. The figure below shows the results for this test. 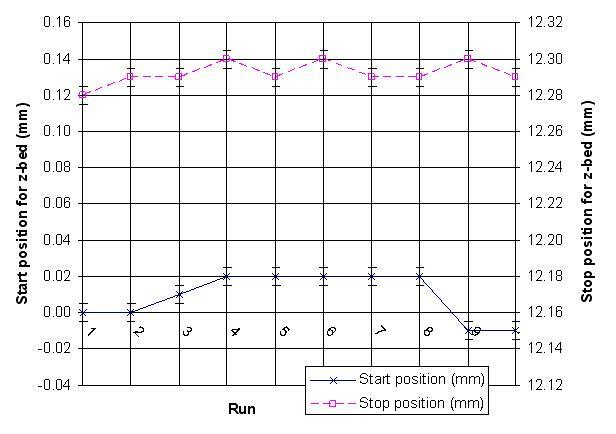 It shows a variation of ± 0.04 mm and ± 0.03 mm variation for both start and end positions respectively using the studding transmission for the z-bed. Not bad, 'specially since we're aiming for an initial accuracy of 0.1 mm. Happy days. So how are you determining that you've got back to start? Simple counting or a limit detector? No - Ed bolts a digital caliper to the machine, which is accurate and repeatable to 0.01mm. I'm impressed with the accuracy, great stuff. I guess with gravity providing the antibacklash, it will stay accurate even as the threaded rod wears out with use. Plaas, and digital calipers are so inexpensive, I could of bought three for the price I paid for a mechanical one 20 years ago. Argh!